The Sprout dinner was a blast. From researching my subject (cows water Jello) to making the slideshow and video (my first experience using iMovie) to staying up till 4:00 am the night before making a giant cow-and-Jello poster to use as a backdrop I thoroughly enjoyed the project. There were stressful moments for sure - packing up my iMac, bags of potting soil trays of live wheatgrass coolers of molded Jello business cards boxes of Jello bowls spatulas measuring spoons clipboards Sharpies blue tape rolls of paper and pretty much the kitchen sink for the display and media presentation into a Zipcar, driving it to the venue, unpacking (thanks Ben), getting the car back on time and getting myself back on the bus to set up. Once I saw the set up and met everyone and got underway I started to really have fun. I found myself laughing out loud as I demolded "live" Jello onto a pile of dirt on a tin tray full of potting soil and wheatgrass. I designed the display to inform and suggest in as real terms as possible my proposed installation at the Lo-Fi Festival. The venue is a giant white arc of a room in a brick church with lots of light and a spacious, old-wood feel. My fellow presenters and I each had a narrow folding table on which to set up our "science project" and it was fun to see each of the approaches and the diversity of ideas. While of course each of the six presenters myself included naturally wanted to be awarded the cash and while each one of the projects was worthy and interesting, the winning presentation, Todd Jannausch's Small Voids is so engaging and was so compellingly presented it seems fitting he got the funding. Clear LED-lit boxes installed outside that will enliven dull spaces and enable 100 artists to have their work seen and bring art to people who wouldn't otherwise see it? Fantastic. The more ways artists can come up with of getting art out of galleries and museums and into the wild where it will be encountered and enjoyed, the better I say. I love this way of thinking. Not to mention being invited to participate as one of the contributing artists to Small Voids. Thank you Todd and congratulations! Thank you also to all of the wonderful Sprout organizers for the opportunity to present, it was a winning experience all around and a great evening. And a huge and heartfelt thanks to my wonderful students and friends who came and supported me and voted for me, you are simply the best. Finally thanks to everyone who came to the dinner. It's heartening and energizing for us artists to see and hear and feel such warm support for what we do. 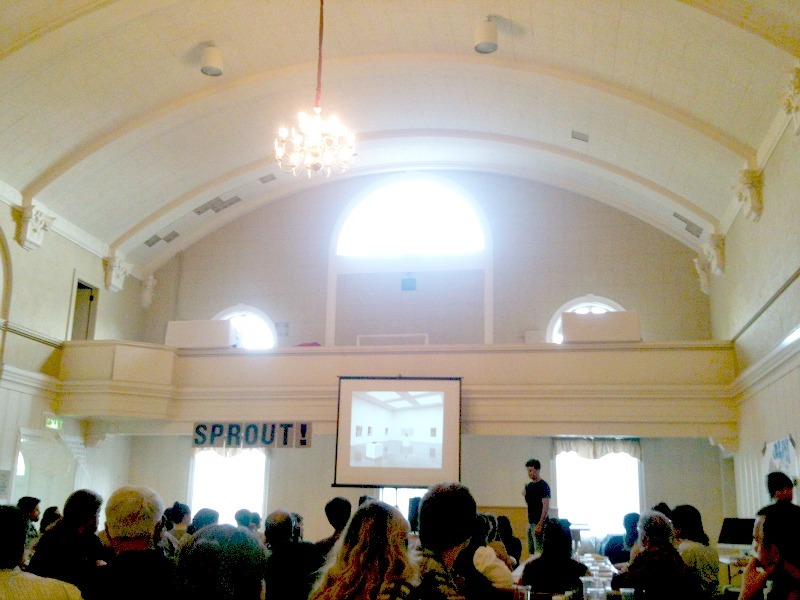 I think Sprout is a truly satisfying and effective way for art lovers to show their direct support for artists. Stay tuned for the next adventure as I attempt to find other ways to accomplish my project. Because I'm an artist and that's what we do.